Perth Ice Sculptures strive to make your day a success. Our stunning ice sculptures bring your event a great decorative piece as well as entertainment. 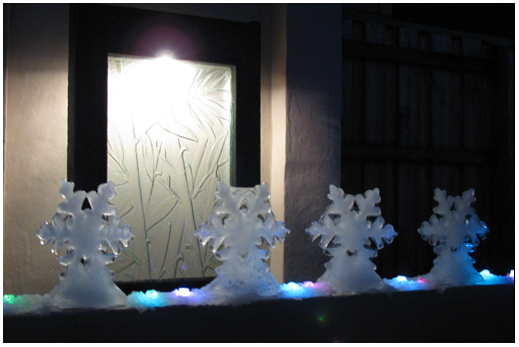 Each sculpture is designed to become more beautiful as it melts away. Together with our lighting and decorative additions we know that your event can be the event of the year that keeps every one talking. Our business is well known for its standard of excellence and good service. We have a range of sculptures that are designed to keep your champagne cold, as well as your heart warmed from the entertainment of a great looking sculpture. Why not serve your champagne in a life boat or in the back of a swan? Or serve your guests a buffet out of a crystal ice bowl, or ice clam for a sea food feel. Have your company logo put in ice as a stylish piece. Bucks and brides maids we have something interesting for you, have a look at the ice sculpture page, don't worry its all good clean fun! All our sculptures are delivered to your door and trays picked up later by us. We will deliver the ice sculptures about 20 minutes before your function depending on setup time. The sculptures are all eco friendly and are great for the environment as well as your enjoyment.